This post is the first in a short series of articles by Mike and Daphne Tregear on the life and works of their ancestor; the publisher and printseller Gabriel Shire Tregear (c.1801 – 1841). The illustrations attached to this article are taken from the extensive collection of Tregear’s prints which Mike and Daphne have amassed over the course of the last twenty years and include a number of extremely rare items. Gabriel Shire Tregear died in 1841 having published hundreds of prints as singly-issued sheets. 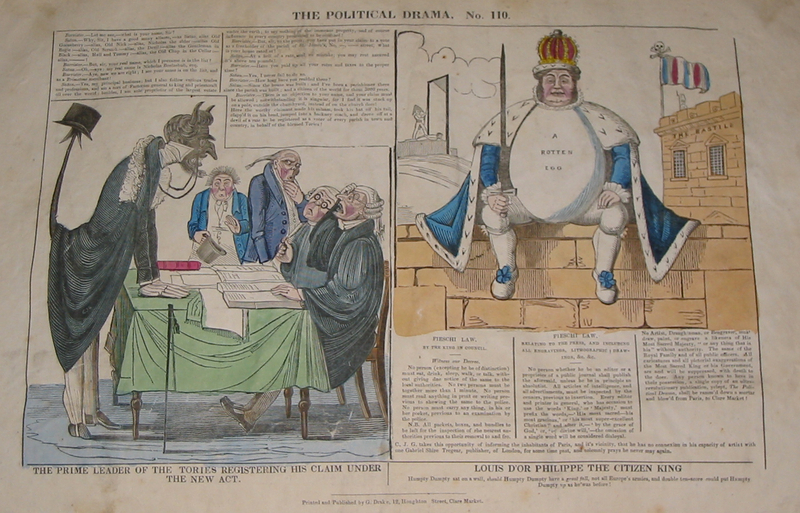 While there were ‘one-off’ topics among these sheets, particularly political caricatures published before the Reform Act was passed in 1832, the output during the 1830s included many series of single sheets with the same title numbered consecutively. Presumably Tregear was hoping to generate repeat custom with this practice. The series included ‘Flights of Humour’, ‘Comic Sketches’, ‘Laughing made Easy’, ‘The Odd Volume’, ‘Fancy Sketches’, ‘Flowers of Ugliness’, ‘Sea Songs’, ‘School of Design’, ‘Humorous Sketches’, ‘Merry Thoughts’, ‘Flowers of Loveliness’, ‘Life in Philadelphia’ and ‘Black Jokes’, and the series which is discussed here, ‘Rum Jokes’. The ‘Rum Jokes’ series of prints has 43 as the highest number which the authors have been able to find. 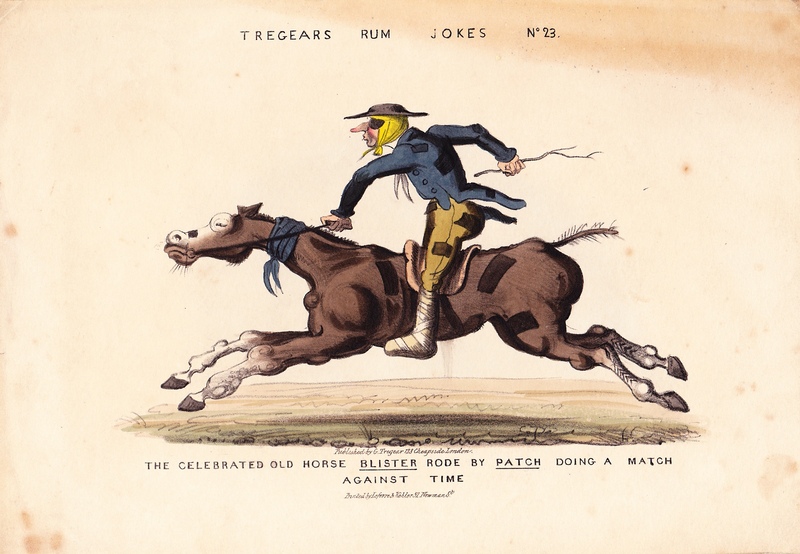 The series started as ‘Tregear’s Rum Jokers’ which is used for the first (right) and second only, after which they are consistently named ‘Rum Jokes’. The topics are split almost evenly between those which are hunting-, shooting-, and fishing-related and those which cover other topics including racing events, skating, billiards and the building trade. None of the prints has a named illustrator or printer but there is clearly more than one hand involved in the designs over the period that the prints are published. 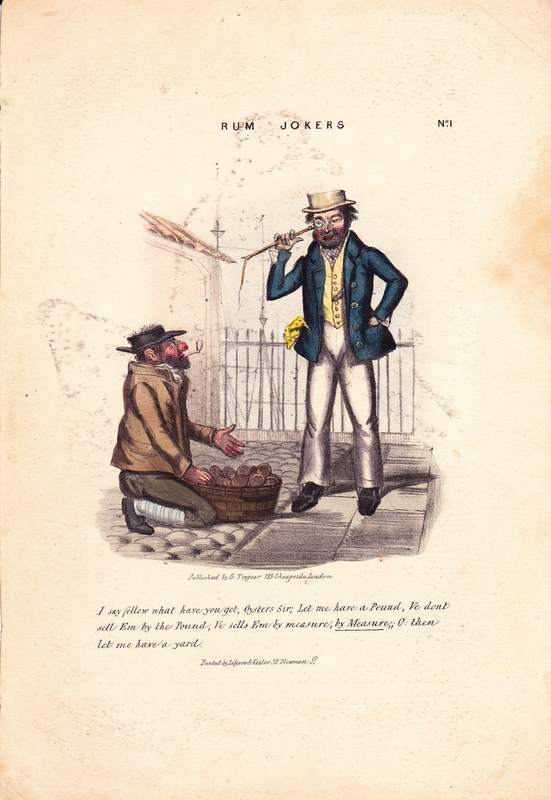 None of them bear a date, but it is worth noting that all of the ‘Rum Jokes’ were published during Tregear’s lifetime and none was ever reissued by Tregear and Lewis (his widow Ann Tregear, in partnership with Thomas Crump Lewis, carried on the business after Gabriel’s death until they fell out, spectacularly, in 1844). While some have an image illustrating a play on words, e.g. no. 4 ‘Twine Gentle Evergreen, A Catch’ which has a black man caught against the trunk of a tree by a large snake, others are simple observations of daily life. So, for example, no. 27 shows a male skater falling backwards though a hole in the ice while young women stand on the bank and observe. The caption is ‘Infernal hole just as I was shewing them Gals how I could do it’. 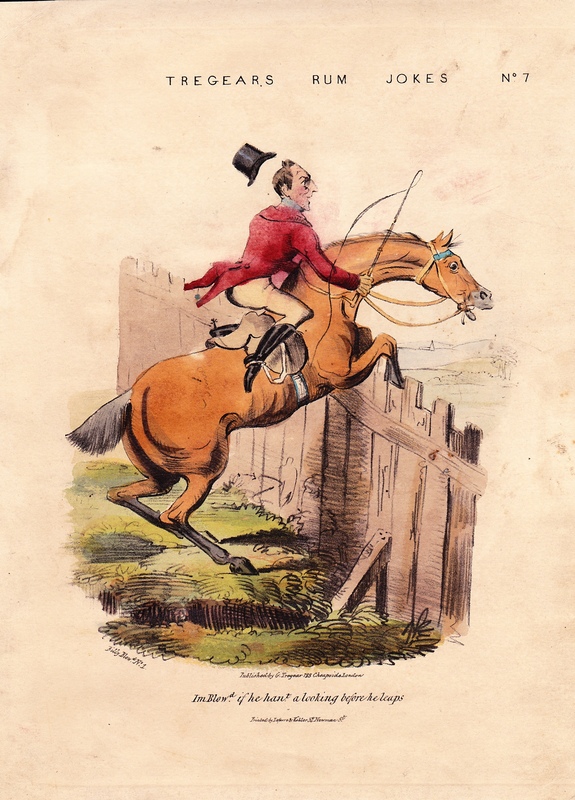 For a short run of prints, all related to hunting with horses (nos. 7, 8, 10 and 11, see the example to the left), there is a secondary title close to the image of ‘Billy Blow’d’ while the caption below the image starts ‘I’m Blow’d’. 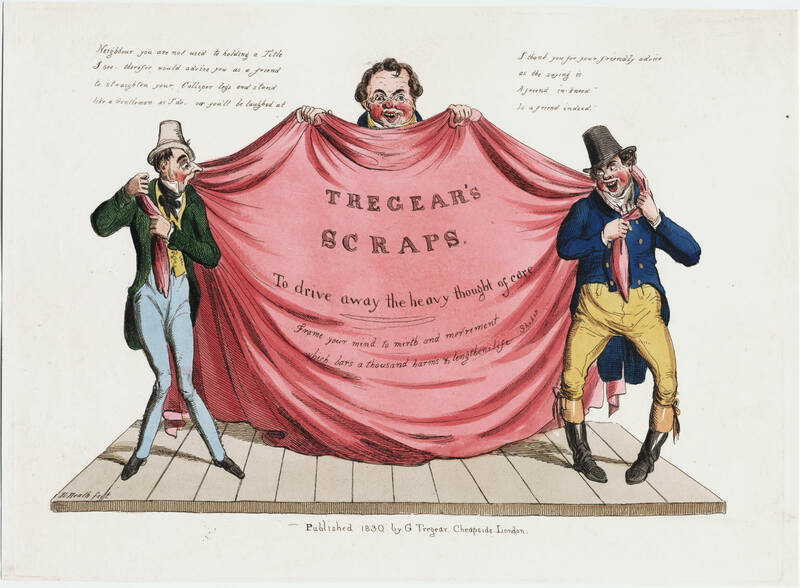 Tregear brought these prints out in two grades, hand-coloured and plain, which was typical of this time in print publishing. When they have been coloured the print is on a fairly good quality stiff paper, whereas the plain are on softer, thinner, yellow or pink paper. They were all lithographs. 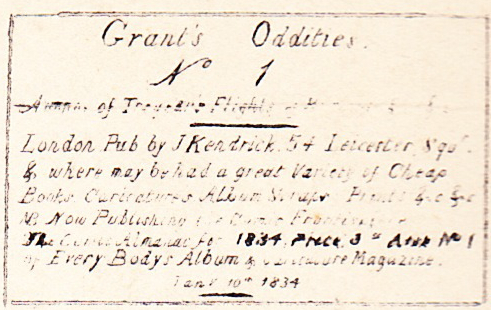 The authors have failed to find any advertisements for ‘Rum Jokes’ as yet, but ‘Flights of Humour’ which overlapped the former’s publication sequence were advertised as 6 pence plain and 1 shilling coloured. 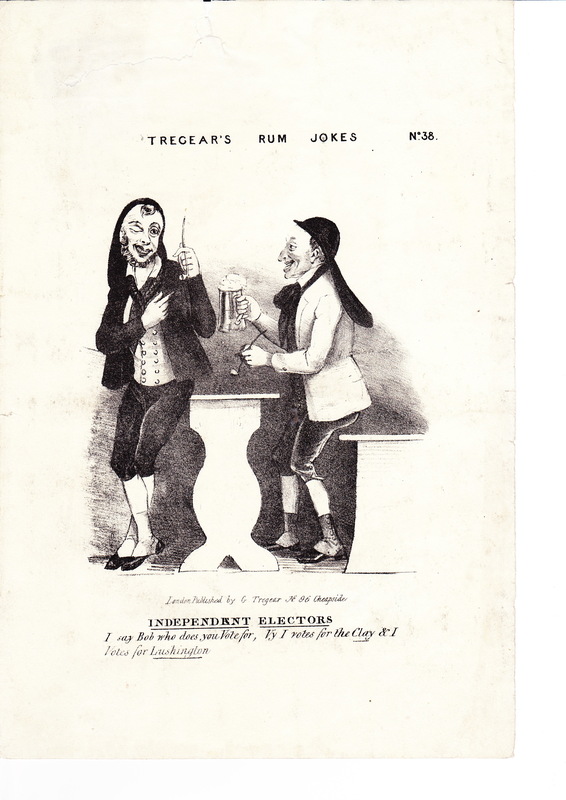 ‘Rum Jokes’ are typical of the cheap end of the market with no detail drawn which is superfluous to getting the joke across; there is none of the carefully drawn background that one would find in, say, a Thomas McLean print. For the most part the characters and the subject of the prints are stock figures. The inexperienced rider, the city clerk in his shooting attire and the country bumpkin in his smock are all represented. However in a few cases a historical figure can be identified. In no.10 the image is captioned by the the phrase ‘I’m blowed if they think I’m Ducrow’. Ducrow was a famous equestrian who in 1824 took over the management of Phillip Astley’s Amphitheatre where large scale and impressive dramas like Mazeppa were staged. Needless to say the rider in the print is clearly not in control of his horse. Corporation Abuses. Pray Sir, what do you call corporation abuses, Why drinking Small Beer and Bad Spirits to be sure. Smug and contented, holding the key to the local authority treasury, our three representatives are shown living a good life at the expense of the local tax payer. 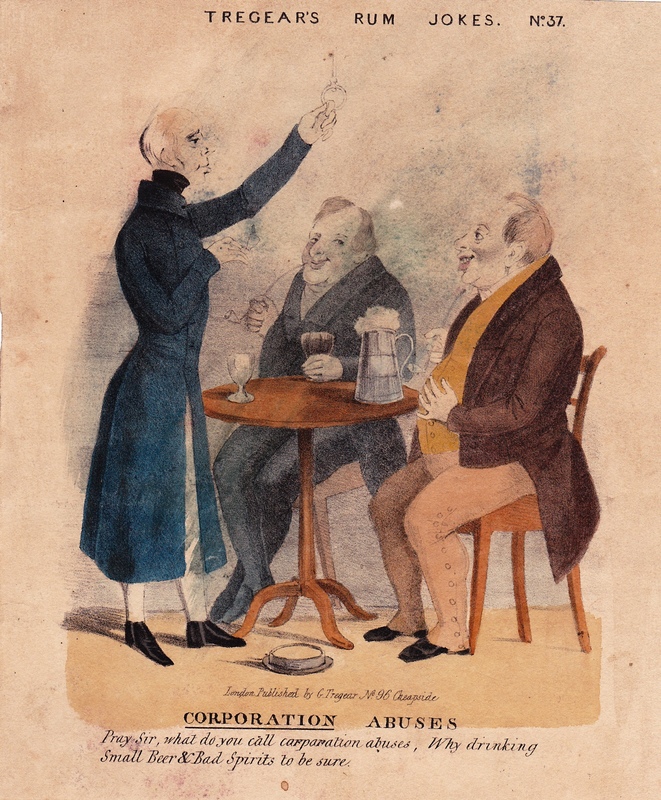 In 1833, after years of pressure from electors up and down the country, the House of Commons sets up a Select Committee to investigate and consider the abuses of power and the use of local tax revenues by local corporations. One of the many acknowledged abuses was the regular use of funds to hold banquets and feasts. As a result of the enquiry the Corporation Act of 1835 is passed. This print is part of the public debate prior to the setting up of the committee. On number 38 (left) the names of Clay and Lushington are used. The caption is ‘Independent Electors.’ which goes on to read as a conversation between two dustmen as ‘I say Bob who does you vote for, Vy I votes for Clay and I votes for Lushington’. These two men were elected to Parliament in 1832 as members for the then newly created constituency of Tower Hamlets. Sir William Clay was a Liberal who represented this seat from 1832 to 1868. Stephen Lushington was a radical and known anti-slavery activist who represented the constituency until 1841. Taking these two prints together it can be suggested that prints up to no. 37 were printed before 1832/33 while those after no. 38 were printed after 1832/33. However, from no. 34 upwards the address of Tregear’s shop changes from 123 Cheapside to 96 Cheapside. We know that he occupied number 123 from 1828 to 1835 and that in 1834 he took a twenty one year lease on 96 Cheapside. So perhaps a better date for publication of those with numbers above 34 is 1834. It is rare for Tregear to use material more than once in his publications. However in the case of no. 23 (right) he has taken one part of a much larger and complicated print and used it as the sole image for the print. The print is titled ‘The celebrated old horse Blister rode by Patch doing a match against time’ (below). It shows a rider with very heavily patched coat and trousers, his stirruped leg bound in bandages and a patch over one eye riding an equally decrepit horse. 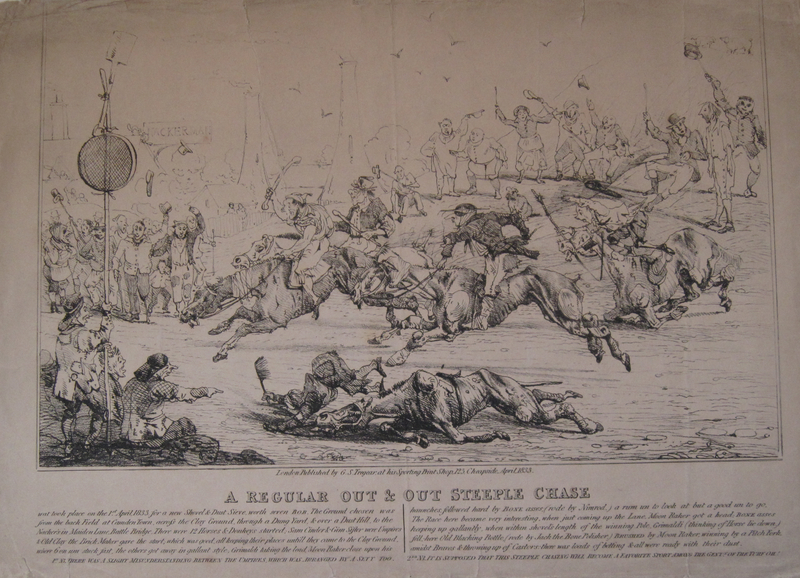 The larger print is ‘A Regular Out and Out Steeple Chase’ which is a parody of professional steeple chasing circles in that the riders are all poorly dressed trades and working men while the horses are nags. This print is dated April 1833. The double entendre in the title of these jokes was also intended to bring a wry smile to the lips and alert the purchaser to its contents. The Oxford English Dictionary lists ‘rum’ as originally a cant term meaning good, high quality, excellent, extraordinary, great. This meaning dated back to the sixteenth century. In the late eighteenth century ‘rum’ acquired an opposite colloquial meaning of odd, strange and also bad, spurious, suspect. Dickens used the term in Pickwick Papers: ‘There’s rummer things than women in this world though, mind you’. So, Tregear used a ‘wicked’ title for some jokes! The authors have been unable, yet, to trace any record of prints in this series with the numbers 9, 12, 21, 22, 25, 33 and 41. There is a copy of no. 24 in the British Museum collection. There may well be more ‘Rum Jokes’ past number 43 which have yet to be identified. Any information on these, or those missing numbers below 43, would be gratefully received. No.29 Well Sam do you see any thing? The works of the teenage caricaturist Richard Newton have grown immensely popular in the fifteen years which have elapsed since they were ‘rediscovered’ by David Alexander in the excellent biography he produced to accompany an exhibition at the University of Manchester. 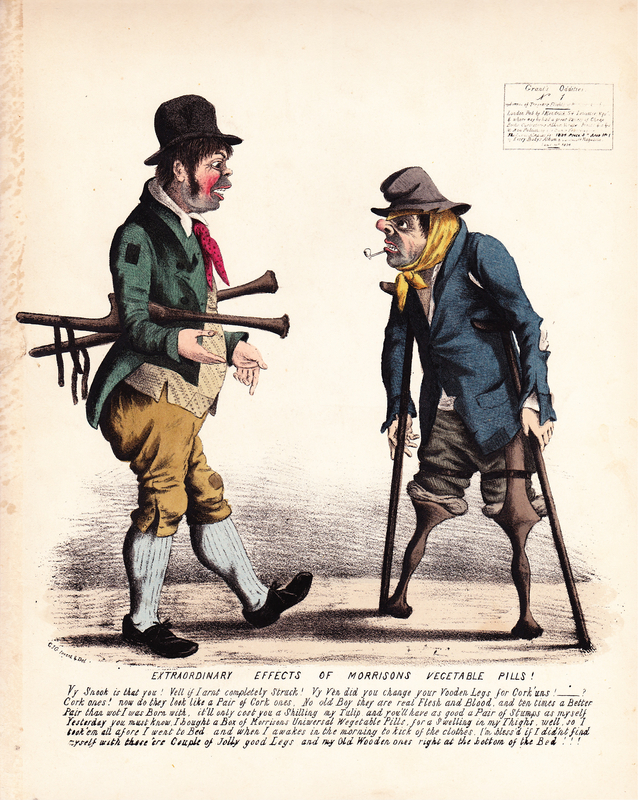 Newton’s grotesquely exaggerated style of caricature and his penchant for the crude and the politically confrontational, has led many collectors to seize upon his work as being exemplary of late eighteenth-century British caricature at its best. The popularity and comparative rarity of many of Newton’s most famous prints means that their value is often second only to that of the Gillray’s most coveted designs, with a copy of A Bugaboo!!! fetching just over £2,000 at the last major sale of caricatures held by Bonham’s auction house in 2010. Newton died on the morning of the 9th December 1798 at the age of just 21. He had probably been unwell for several months, although the precise nature of this illness and the cause of death remain a mystery. David Alexander notes that a brief obituary appeared in the London Oracle of 14th December, which was the day of Newton’s funeral, and in the monthly edition of the Gentlemen’s Magazine . I believe I may have also uncovered another obituary, published two days before the notice appeared in the Oracle which contains one hitherto unrecorded fact about the enigmatic young caricaturist’s life. This obituary appeared in the Hereford Journal of Wednesday 12th December 1798 and it describes Newton as “a native of Dormington, in this county”. If this assertion could be proven to be correct then it would significantly alter what little we know of Newton’s background, as he is typically thought of as being a native Londoner, the potential son of a haberdasher named Richard Newton who was resident in Brydges Street Covent Garden at the time of the 1784 Westminster election. Newton may well have been the son of a Herefordshire man who relocated to the metropolis sometime after his birth in 1779. On Sunday morning died, in the 21st year of his age, Mr Richard Newton, Caricaturist and Miniature-painter, of Brydges-street, Covent Garden, London – a native of Dormington in this county. His natural abilities and fertile genius promised a rapid course to first-rate eminence in his profession : and his early loss will be long regretted by his relations, friends and numerous acquaintances. [1.] Alexander speculates that Newton may have died from tuberculosis. David Alexander, Richard Newton and English Caricature in the 1790s, 1998, p. 54 f.106. Friench Liberty, [sic] Liverpool pearlware bowl, after Gillray. c.1792. You may remember a post which appeared on this blog some time ago, in which we looked at a nice example of a creamware tankard that had been decorated with the one half of James Gillray’s French Liberty / British Slavery. 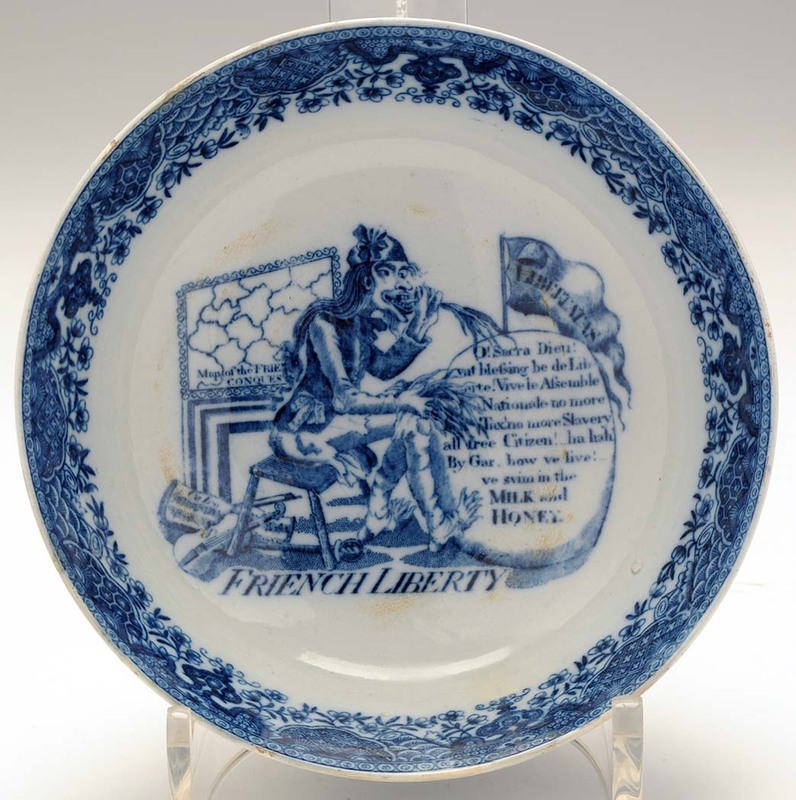 It was particularly interesting to note that while the British half of this design appears to have been taken up and used by a number of provincial potteries, surviving examples of ceramics carrying French Liberty were far more rare. 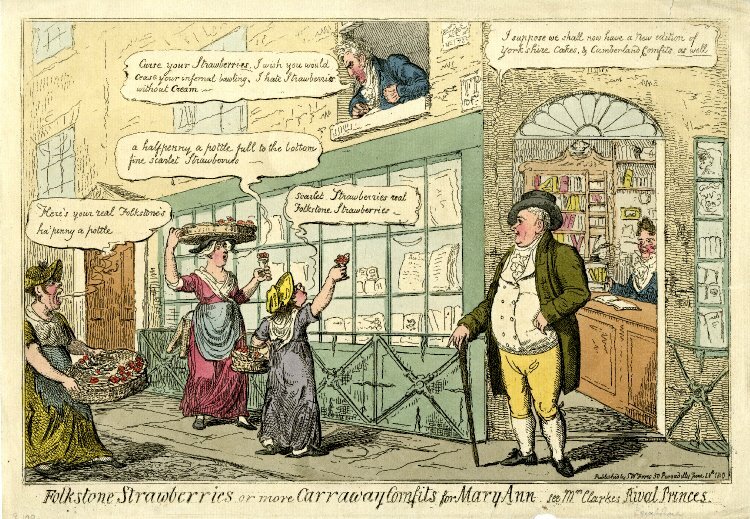 Indeed, David Drakard was only able to locate a single example of Gillray’s image of the onion chomping sans-culotte when he came to compile his exhaustive catalogue of caricature-printed creamware in the early 1990s. I was therefore feeling particularly pleased with myself when I ran across this little beauty in a local saleroom recently. It’s a blue and white pearlware bowl, measuring 23cms in diameter, decorated with a copy of French Liberty. This example illustrates quite nicely how potters were sometimes required to alter caricature designs in order to ensure that complicated compositions fit into the restricted space left available on pots for a decorative design. In this case the potter, evidently a craftsman of some skill, has shifted the background of the design to the left, omitting the bowl of onions that appears in the original print and placing the fireplace and map to the sans-culotte’s side. The central figure now sits in front of a cartouche that carries his ironic speech about swimming in “de Milk and Honey” of liberty. There are two other things that I particularly like about this design, firstly that the potter has taken it upon himself to make additions to Gillray’s original image, adding a sheet of music for the revolutionary anthem “Ca Ira” next to the violin at the Jacobin’s feet and a flag of liberty to his right. And secondly, that the potter’s tenuous grasp of the written word has caused him to misspell both the title of the design and the ‘Libertas’ logo which appears on the flag. The transfer-printing process and the practical impact this had on caricature designs used on pots is a subject I plan to explore in more detail in my next post.